Today is Transgender Day of Visibility, an annual day dedicated to elevating and celebrating the stories and experiences of transgender people across the country. 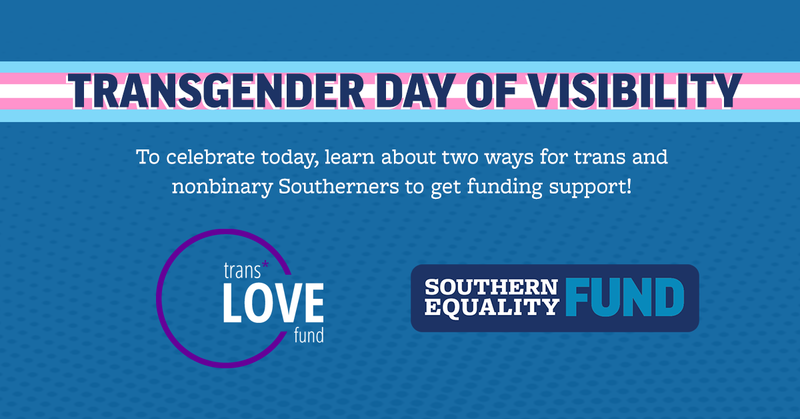 To honor this day, the Campaign for Southern Equality is highlighting two great funding opportunities for transgender people in the South: Our own Southern Equality Fund and the Trans Love Fund program from the Alliance For Full Acceptance (AFFA) and We Are Family. Learn more about both – and apply! The Southern Equality Fund(SEF) provides funding and training to Southern LGBTQ folks doing heroic organizing in their hometowns. We prioritize groups and individual leaders whose access to funding and support is limited due to barriers such as not having 501c3 status, or being located in a rural area. Have an idea to promote equality, safety, and/or visibility of LGBTQ people in your community? Click below to apply for a grant! We’ve made the funding request short and simple and we’ll give you an answer as quickly as possible. At the Campaign for Southern Equality, we understand funding alone is not enough to sustain grassroots LGBTQ leaders and amplify the impact of their work. They also need a continuous flow of resources, including relationships with peer organizers, individualized coaching, and training. We strive to provide this ecosystem of support through our leadership development cohorts, Resource Mobilization team and by providing training webinars and other supportive resources. Applications for the Southern Equality Fund are available on a rolling basis. The Trans Love Fund is a program of the Alliance For Full Acceptance (AFFA) and We Are Family. It supports trans and nonbinary people across South Carolina. The application deadline for the Trans Love Fund is April 15, 2019! Be sure to learn more and apply.